When billionaire John Paul Dejoria first started John Paul Mitchell Systems, he was living in his car. "I'd just left a relationship that I was in," Dejoria recalled in an interview with CNNMoney. "I had very little money." But he'd been working in the hair care industry for five years, and was ready to start a business of his own. He scrounged together $350, and teamed up with his friend hairstylist Paul Mitchell, who contributed another $350. They set up a PO Box and an answering machine at a friend's house. Then they started selling shampoo and conditioner door-to-door. By then, Dejoria was already used to facing challenges. His father left his family before Dejoria turned two, and he spent a few years in a foster home when his mother became ill.
"I always worked," he said. "At seven years old I would sell boxes I made at the Variety Boys Club." As an adult, Dejoria sold encyclopedias door-to-door. "With no appointments and no leads, a lot of doors were slammed in our face," he recounted. The experiences helped prepare him to launch John Paul Mitchell Systems in 1980. "I realized how to overcome rejection." And Dejoria believed in his product. "I knew we had one of the best products in the world," he said. He faced rejection after rejection, but stayed positive. The trick, he explained, was to "be as enthusiastic on beauty salon number 101, or beauty salon number 110 or number 5, as I was on the very first one." Eventually, the hard work paid off. After two years, Dejoria and Mitchell were able to pay their bills on time. "We knew we made it," he said. "Now, on to bigger and better things." The business flourished. Today, John Paul Mitchell Systems sells more than 80 products, and Paul Mitchell Schools, which helps train barbers, estheticians and cosmetologists, has more than 100 locations. Nine years after he had set up the hair care empire, Dejoria was ready for a new challenge. In 1989, Dejoria and his friend Martin Crowley were drinking margaritas at Dejoria's house. The alcohol, Dejoria recalled, was "a little rough." Crowley was heading to Mexico for a business trip, and Dejoria asked him to bring back better tequila. "I said, 'Martin, when you go down there, try and find ... what the aristocrats drink and bring us back a bottle.'" Crowley did, and told Dejoria he had met a tequila chef who could whip up an even smoother tequila. Patrón Spirits International was born. Once again, Dejoria found himself facing rejections. "Nobody would take us on because it was too expensive," Dejoria said. While other high-end tequilas were selling for about $14, Dejoria remembered, Patrón was priced at $38 a bottle. "We had to convince a wine distributor to take it," Dejoria said. Once again, "we went out ourselves and knocked on doors." They took their tequila to bars, and poured out shots for bartenders. "They said, 'Wow, that's really good.' 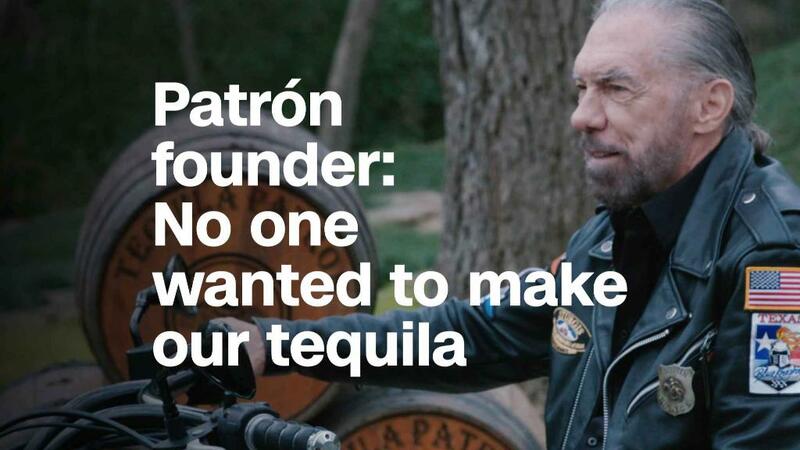 We said, 'It's the tequila of the future,'" Dejoria said. Eventually, the business started growing. In its first year, Patrón produced 1,000 cases of tequila. Over time, that number ballooned to 2 million. "People realized it's okay to pay a few dollars more if you treat yourself," Dejoria noted. And suddenly, "Patrón was everywhere." In January, Bacardi agreed to buy Patrón Spirits International for $5.1 billion. Dejoria says that "success unshared is failure." "If you don't take a little bit of your time ... to help somebody else out," Dejoria explained, "you're not really a successful human being." For him, "giving, sharing and caring about others and business go hand in hand." He also thinks his achievements would not have been possible without those early difficulties. "A lot of the things that happened that went wrong, really wrong, were experiences and an education," he said. "That education was priceless."